The doors to the garden mysteriously open in the morning to reveal a lovely quiet space. One of the most lovely hides just steps from the mayor’s office in via Santa Giustina. Passersby once could only catch a glimpse of the garden thru the iron grates. 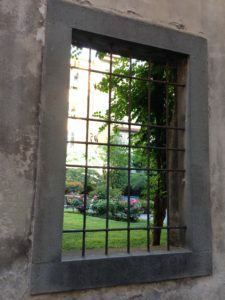 The garden’s walls that rise over 20 feet once kept out all but the Pierantoni family which most recently owned the adjoining Palazzo facing Piazza del Salvatore #1, aka della Pupporona. In the past, one could only stand on tiptoe to peer thru the iron grates in the wall for a glimpse of the garden. 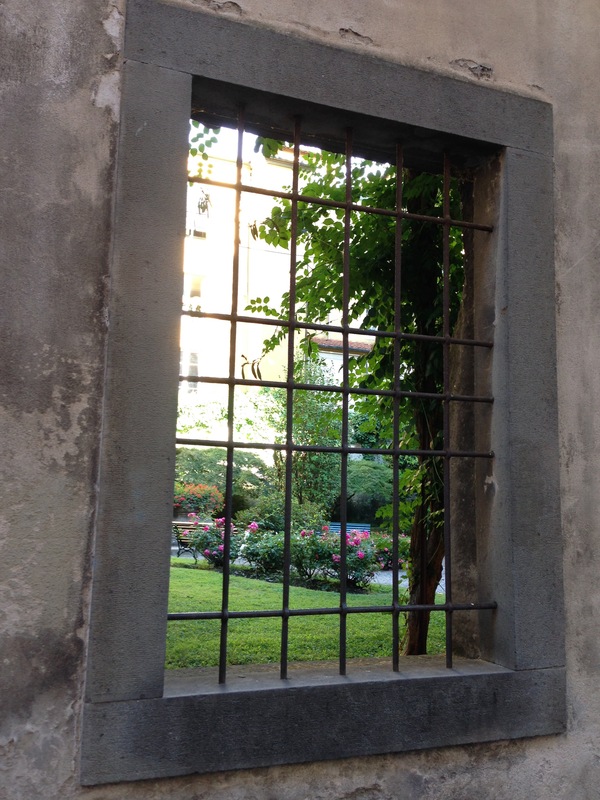 But for a few years now, the doors to the garden at via Loreto, 21, mysteriously open every morning and close again at night, providing conoscienti the chance to rest under the garden’s ancient, overarching wisteria or catch the scent from its sweet roses. Warning: no dogs or picnicking allowed. The rationale: finding peace is a serious business that requires quiet contemplation. If you are observant, you can catch glimpses of more gardens like this one spread throughout the city. 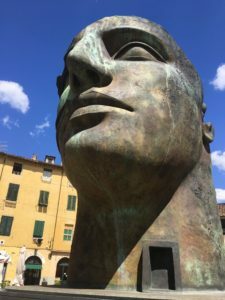 In fact, at least until the 19th century, almost every building inside Lucca’s walls had a garden, or in the absence of this, benefitted from the presence of an open space or orto, in even the smallest dimensions, according to historian Domenico Taddei (170). Being proponents of humanist values, renaissance Lucchesi began incorporating gardens into the plans for their palazzi for both practical and aesthetic reasons. The water feature was tied to a well that supplied potable water. 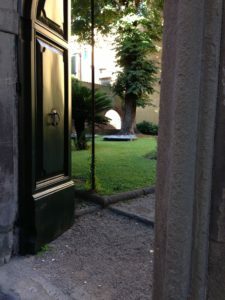 Ornamentals stood in close proximity to the residence so that the proprietor might, from inside, relish the garden’s amenities, according to a 16th century directive cited by Taddei. Even the regular subdivision of the plantings, the position of the walkway axis with regard to the residence, the pergolas and the placement of benches along perimeter walls and walkways, the addition of lemon trees in vases along the central pathway, all corresponded to universal criteria that were readily accepted and applied to garden design thru the 19th century (171). Thankfully, examples remain to be enjoyed to this day. 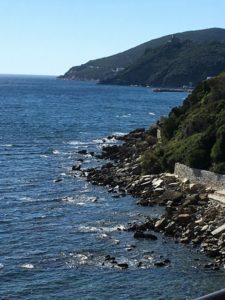 Check out the gardens of: Palazzo Pfanner, Villa Torrigiani, Giardino Garzoni, and Villa Mansi to name just a few…. 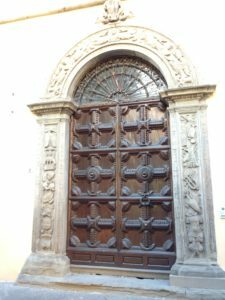 As you leave the garden, admire the ornate carvings on the entrance door to the Palazzo Orsini across the way on via Loreto.